Hear the words “deer hunting” and you’ll likely think of the ubiquitous whitetail—and for good reason. You can find this species in 44 states, usually in plentiful numbers on private and public lands, while Alaska and California are home to the elusive black-tail, Nevada and Utah and several other states have mule deer, and the diminutive Coues deer can be found in Arizona. How do you hunt a deer? East of the U.S. center spot the treestand is king, with the South and Texas also utilizing ground blinds. The Northeast’s quiet forests and those of the Pacific coast can be great for spot-and-stalk hunts, while long-range glassing and a tactical approach to getting within range are the provenance of western states. For a unique thrill, the South’s deer drives, often using dogs, are about fast shots, filled tags and a celebration feast for the community. (Trivia: The only state that lacks a native deer population is Hawaii!). When it comes to long-range shooting at big game animals like deer and elk, the best advice is don’t do it. Do your hunting before you pull the trigger and get as close as you can before you take the shot. That will eliminate a lot of potential problems.That said if you are going to try long-range big-game hunting, do it right. You owe that to the game you hunt and to the ethics of sport hunting we all support. One big, often ignored factor in making long-range shots on big game is terminal ballistics. Far too many hunters pick a cartridge and bullet that are designed for long-range target shooting. The problem in that is that the goal in target shooting is simply to hit the target. When hunting, you must also be able to also dispatch the animal humanely.Long-range target bullets are designed for accuracy and a high ballistic coefficient, which is a measure of atmospheric drag on the bullet in flight. They are not designed for predictable expansion on animals the size of deer and elk. For that you need a hunting bullet, and most hunting bullets will have a minimum impact velocity required to guarantee expansion. Usually, it’s somewhere around 2,000 fps (feet per second), although that can vary from bullet to bullet.Some of my favorite bullet choices for long-range hunting include the Barnes LRX, Nosler Accubond Long Range and the Hornady ELD-X. They are accurate, provide a high ballistic coefficient to retain energy, and will expand and penetrate at long range. The cartridge must also have sufficient power. The long-accepted rule for hunting cartridges is that the bullet should deliver a minimum of 1,000 foot-pounds (ft-lbs) of energy to the target for deer-size game. There are a few exceptions to this rule, but none apply to long-range hunting.Many of the popular long-range target cartridges drop below both of these thresholds at far shorter distances than you might expect — often at 500 yards or less. The solution is to either pick a more powerful cartridge that can deliver a well-designed bullet with sufficient energy to the target or limit the distance of your shots. At what distance does long-range shooting begin? In this video, Bryan Litz, Founder and President of Applied Ballistics, LLC, Chief Ballistician at Berger Bullets and champion rifle shooter, defines long-range and extended long-range shooting. The cartridge you pick depends a lot on how far you will shoot. If the cartridge can deliver a hunting-weight bullet of at least 100 grains to the target with 1,000 ft-lbs of energy, then it’s a fine cartridge for the job. Anything from the .25-06 Remington through the various .300 magnums will work for long-range deer hunting.My all-time favorite long-range hunting cartridge is the .300 Winchester Magnum because it provides a lot of options. It’s very accurate, shoots flat and hits hard at long range. With a 200-yard zero, it impacts 6.5 inches low at 300 yards. It carries 1,000 ft-lbs of energy out to 925 yards, farther than I will ever shoot at an unwounded big-game animal. 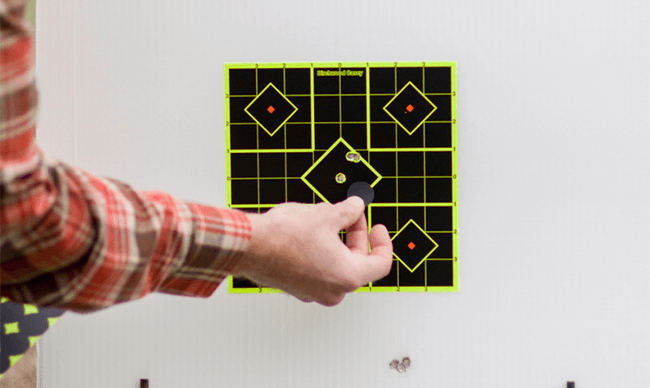 [caption id="attachment_2597" align="aligncenter" width="650"] A hunting reticle, like Leupold’s Boone & Crockett reticle, has a center point that can be set at a 200- or 300-yard zero depending on the users’ ammunition, making it ideal for long-range hunting. Longer horizontal marks provide 10mph wind holds. [/caption]If it matters, the longest shot I have ever made on a deer was with a .300 Remington Ultra Mag. It’s also the cartridge I used for my longest shot on elk and my longest shot on red stag.My current favorite is the .280 Ackley Improved. This former wildcat cartridge is now mainstream, with ammo from Hornady and Nosler easily available. My custom rifle pushes a Barnes 139-grain LRX at 3,150 fps with moderate recoil. With a 200-yard zero, it’s only 5.78 inches low at 300 yards. It carries 1,000 ft-lbs of energy out to 800 yards. Another huge factor in successful long-range hunting is the hunter’s ability to hit the animal’s kill zone every single time. The dirty little secret that many who are promoting long-range hunting keep hidden is how difficult that can be under hunting conditions.Rifles, optics and ammo have improved vastly over the years, and that has extended the ethical distance for shooting at game. What has not changed, however, is the cold, hard truth that you can’t buy skill; you must earn it. Before considering long-range hunting, you should burn a lot of powder to build the skills needed and to determine your MED (maximum ethical distance) to attempt a shot. [caption id="attachment_2594" align="aligncenter" width="650"] Learning to shoot accurately at long range takes practice. Spend time at the range learning to shoot off your pack or shooting sticks to simulate hunting conditions. [/caption]My method is biased to the animal being hunted and sets a tough standard for the shooter. The first step is to determine the distance at which you can hit an eight-inch target every single time you pull the trigger. That means under any weather conditions and from any field position, and not just on a good day or most of the time, but every time. It also means that you can do it when you are cold, wet, miserable, tired, out of breath and stressed.You find your MED number by shooting a lot and by pushing yourself. Go to the shooting range on those nasty days when you would rather stay home. Shoot from the positions you don’t like rather than just practicing what you do well. Try running 50 yards to your rifle, then make the shot when you are breathing hard. It takes a lot of shooting to develop the required skills. The upside is that long-range shooting is a lot of fun.There is a huge difference between a shooter’s ability to hit a target at the range and their ability to humanely dispatch a big-game animal at far distances. Most experienced hunters have learned to control their emotions enough to make the shot, but it’s never 100 percent. Nobody is that stone cold. Once you find the distance at which you can make the shot every single time, subtract 20 percent to allow for the adrenalin and other stress factors when hunting.Long-range shooting is both a physical and a mental game and requires a mastery of rifle shooting skills. Every error you make will be magnified as the distance increases. A wobble of one inch at 100 yards becomes 10 inches at 1,000 yards. [caption id="attachment_2595" align="aligncenter" width="650"] Practice at the range until you find the distance at which you can put all of your shots into an 8-inch group, then subtract 20% of that distance to allow for factors that can affect your shot in the field such as adrenalin or being out of breath. [/caption]It’s important that you be honest with yourself in the evaluation. Your MED will likely be much shorter than you probably expected and no doubt closer than the shots you see other hunters bragging about on the web and TV. Remember, your obligation is to be ethical with the game you are hunting. You are taking a life, and that means something. At least do it right. If you want to test your skill at longer ranges, do it on targets. There is far less heartbreak with a miss on a steel target than if you wound an animal. The equipment you choose is important as well. Your rifle must be accurate. The rule of thumb is that a hunting rifle is considered to be very accurate if it can put all the bullets fired into one minute of angle (MOA) which, for practical purposes, equals one inch at 100 yards.For the record, I have tested a lot of factory rifles over 36 years as a professional gun writer. Few can achieve this accuracy mark. For serious long-range hunting, you most likely will need to hire a gunsmith to tune your rifle for accuracy. [caption id="attachment_2596" align="aligncenter" width="650"] An accurate rifle, chambered for a long-range cartridge like the .300 Win. Mag., is critical for long-range hunting. In the author’s opinion, such rifles should be capable of placing all five shots into 1 MOA or one inch at 100 yards every time. [/caption]MOA expands its width with distance. It roughly corresponds to adding an inch for every 100 yards of additional distance. So, at 1,000 yards, one MOA equals 10 inches. That means if your rifle is well tuned and you break the shot with perfect precision, you are only guaranteed to hit a five-inch target at 500 yards. That does not yet include any of the multitude of variables, which can open the group up even more when shooting in hunting conditions.That does not yet include any of the multitude of variables that can open the group up even more when shooting in hunting conditions. For example, if you factor in that one-inch wobble we mentioned, you are now only going to hit a 10-inch target at 500 yards. That’s larger than our eight-inch kill-zone standard for deer (and we have not yet talked about wind or other environmental factors that can affect the shot). In this circumstance, with a one-MOA rifle and allowing for one inch of shooter error, the distance to keep all the shots on an eight-inch target is 400 yards. Already much closer than you expected, right?Better skills and a more accurate rifle can extend that. But, it’s not easy. The alternative is to try the following. In this video, Former Army Ranger sniper team leader Ryan Cleckner explains the measurement term "minute of angle" (MOA) and how to use MOA adjustments on your scope for sighting in and to compensate for bullet drop at varying distances. If you shoot a rifle with a modern, high-velocity cartridge and pointed hunting bullets, set your zero for 200 yards and don’t worry about the math.Depending on the cartridge, the bullet will impact one to two inches high at 100 yards and five to eight inches low at 300 yards.For any shot from 100 to 300 yards, simply hold on the critter, perhaps a bit higher for the longer distance, but always on hair (not air), and you will hit the deer.Past 300 yards, it becomes necessary to either hold over or dial up the elevation on your scope. Better yet, simply limit your shots at big game to 300 yards and you’ll be doing the right thing.About the Author Bryce M. Towsley has been writing about guns for 36 years and has published thousands of articles in most of the major firearms magazines. He has hunted all over the world and is a competition shooter in several disciplines. Towsley has several books available on guns, shooting and hunting as well as an adventure novel, "The 14th Reinstated." Signed books are available on his website.Special thanks to StepOutside.org for providing this insightful content. These five classic Western hunts are all on public land, so you can go on your own for elk, mule deer, upland birds and waterfowl. Is there a greater gift — or a more appealing challenge — for an American hunter than chasing game across public land, using only your instincts, gear and grit to fill your tag?For many Western hunters, this challenge is literally part of the landscape. West of Nebraska, public land is abundant and accessible. Hunting opportunities are varied and plentiful. And while outfitters do good business, most hunts are open to anyone with a tag and a willingness to learn the country and the animals, and who can take care of themselves in landscapes with few signs of human development.But a Western hunting trip is seldom as easy as loading up the Suburban and pointing it toward the sunset. Many big-game tags require years of going through the application process before you draw. Season dates, bag limits, and hunting unit boundaries often change from year to year. And then there’s the scale of the country. It’s big and wild, and often requires specialized gear. Sound intimidating? It is, but don’t let that scare you away from an awesome adventure. Here’s a way to get started.These five hunts represent classic Western public-land adventures, but they don’t require years of planning and license preference-point accumulation. And all are easily accomplished with basic gear. Best of all, you can do them right now! The clock is ticking on the largest native upland bird of the West. Sage grouse are a perennial candidate for listing as an endangered species, mainly because of habitat loss. Hunting opportunities for “bombers,” as sage grouse are often called for their ponderous flight, have been restricted over the years. Currently, only a couple of states offer sage grouse hunting. [caption id="attachment_2548" align="aligncenter" width="650"] A Wyoming sage grouse hunter admires the wingspan of a mature grouse. Much of the best hunting takes place on public land in Wyoming. [/caption]Wyoming has the most abundant sage grouse population in the West, but the season runs for only a fortnight in the best area, called Hunt Area 1, which basically covers the western half of the state. The season runs Sept. 16-30 this year, and hunters can bag two sage grouse a day and keep four in possession. Nonresident hunting licenses cost $74 for the season (allowing you to also hunt sharptail grouse, partridge, and pheasants), or $22 per day. There’s also a nonresident youth license, which costs $40 per season and is a good incentive to bring young hunters on this classic Western bird hunt.GO HERE: The Cowboy State’s best sage grouse area is the expansive sagebrush sea along the historic Mormon and Oregon trails, from Casper west to South Pass. Almost all this land is public (managed by the Bureau of Land Management, and you can camp and fish on much of these federal properties. During late September, hike riparian washes and areas with tall, shady sagebrush, where the birds will seek shade and bugs on hot autumn afternoons. Sky-darkening flocks of waterfowl, abundant public access and one of the most varied bags in the West are all within sight of metropolitan Salt Lake City. Waterfowling Utah’s Great Salt Lake is one of the most accessible and productive hunts in the West. [caption id="attachment_2549" align="aligncenter" width="650"] Late-season Great Salt Lake ducks don’t require many decoys, but weather can bring snow and freezing fog. [/caption]Even better, it doesn’t take a lot of planning or gear to bag ducks here in this sprawling inland sea, surrounded with abundant public marshland. For good pass-shooting and decoying with small spreads, head to Bear River Migratory Bird Refuge on the northeast shore of Great Salt Lake.GO HERE: Set up on dikes on Farmington Bay Waterfowl Management Area, where a small boat will get you away from the crowds and allow you to decoy diving species like redheads, buffleheads, ringnecks, and even the mighty canvasback, the trophy bird of American waterfowlers.For season rules, license fees, and open (and closed) hunting areas, check out the annual Utah Waterfowl Guidebook. Drawing a Montana nonresident deer or elk tag can take years of preference-point accumulation or you can buy a bear tag over the counter and hunt the same public areas as you would for antlered game. [caption id="attachment_2550" align="aligncenter" width="650"] A Montana black bear works down a side-slope in the Helena National Forest. [/caption]There is a catch; you have to take a simple bear-ID test to prove that you can tell the difference between black and grizzly bears, which often share the same habitats in western Montana. The other thing you should know is that bear hunting in Montana is entirely spot-and-stalk. Neither baiting nor hound hunting is legal in Montana. Those restrictions actually improve the hunt; black bear hunting is so similar in locale and style to deer and elk hunting that a bear hunt is a great primer for hunting antlered game.GO HERE: National forests and wilderness areas from Bozeman to Kalispell offer the best bear hunting. Specific forests include the Lewis & Clark, Flathead, and Lolo. For a directory of each forest, as well as maps showing public-land boundaries, contact the Region 1 office in Missoula, Montana. A trophy mule deer buck tag for Arizona is one of the most coveted permits in America. But the Grand Canyon state offers abundant hunting opportunities for both mule and Coues deer for hunters who use archery gear. [caption id="attachment_2551" align="aligncenter" width="650"] Late-season Arizona mule deer are widespread on public land. [/caption]Many units are open for late-season bowhunting on over-the-counter tags (OTC). And there are few better ways to escape the winter blues in the rest of the nation than spending late December and January in Arizona’s deer country. Both mule deer and Coues deer are huntable on these OTC tags, and because the season corresponds with the Coues deer rut, this is one of the best times to see a number of the gray ghosts in the desert mountains.Tags are reasonably priced — $160 for the nonresident hunting license plus the $300 deer tag (resident prices are $45 and $57, respectively) — and units are as varied as Arizona’s terrain. Arizona’s online hunt planner is a great way to identify open units and plan for the mix of terrain and season types that each offer for deer hunters.GO HERE: For Coues deer, hunt the southern mountains, especially units east of Tucson and near the New Mexico border. Mule deer and Coues deer roam the units along the Mexican border east of Nogales. With the largest elk herd in the nation, over-the-counter tags and abundant public land, Colorado is an elk-hunters’ destination. Problem is, all that opportunity can lead to frustration unless you do some solid homework and plan to hoof it to get away from access roads and the crowds they attract. [caption id="attachment_2552" align="aligncenter" width="650"] Colorado has the most elk of any Western state with over 300,000 animals; many on public land. [/caption]Plan on either the 2nd or 3rd rifle seasons, which run Oct. 20-28 and Nov. 3-11 this year. During these periods, snowfall isn’t too extensive, and elk are still fairly well distributed on public lands. The tough thing is that a big high-country snowfall could certainly change your plans overnight.GO HERE: For planning, a great starting point is the state’s digital hunting atlas, which shows unit boundaries and game-management unit designations. Cross-reference that information with harvest statistics from Colorado’s Craig region, available from the Division of Parks & Wildlife’s excellent hunting guides, and you should have a good idea of where to find both public land and huntable elk.The rest is up to you, and your gear. People assume that with over 300,000 head of elk, there’s a wapiti behind every tree. The reality is that to have consistent success in Colorado, you need the ability to hike hard, spend long days in the field, and have the flexibility to move up or down in elevation, or deeper in the backcountry, as conditions dictate.About the Author Andrew McKean is a longtime outdoor writer and the former editor-in-chief of Outdoor Life. He lives in northeast Montana with his family and yellow Lab. You can follow his adventures on Instagram @aemckean or on Facebook @andrew.mckean.Special thanks to StepOutside.org for providing this insightful content. In this video, Connecticut Hunter Education Instructor Dieter Bromkamp explains the importance of having and maintaining a solid scent control regimen and offers many tips that you can implement before your next hunt. When it comes to choosing a perfect pup for hunting that can also be a great family pet, pedigree is everything. People have a lot of methods for picking a puppy, but most of them involve trying to evaluate a litter of six-week olds to find the right temperament. This, essentially, is impossible. You can’t look at the behavior of a newborn puppy and accurately predict how it will be as an adult any more than you can with a newborn baby.No matter how timid a puppy seems, or how overtly aggressive a puppy is when compared to its littermates, you won’t be able to make a great call one way or another. By that point in the process, the only decision you’ll really be making is on looks. The true method for picking a perfect puppy is to start long before it’s born by studying its pedigree.One of the most common bird dog legends involves the shelter dog, or the accidental farmhouse Lab, that grew into a bird-hunting machine. We love those stories because they give us hope that any old dog can be amazing in the field. The truth is, those dogs are outliers and their field prowess likely benefits from a bit of storytelling license.To get an amazing hunting dog, or at least hedge your bets, you need to dig into bloodlines. Whether you’re looking for an English setter to hunt quail with, or maybe a golden retriever with a nose for roosters, you need to research not only the parents but the grandparents of the litter. This serves a couple of purposes, the first being health. And any dog that sports a solid pedigree will likely possess plenty of drive and athleticism. These two assets are extremely important to hunting ability. If you want a dog that can hunt the big woods of northern Wisconsin for ruffed grouse all day, you want a dog that has some athleticism in his background. You can’t look at a puppy or play with it for a few minutes and determine anything about how it will turn out as a bird dog despite common belief to the contrary.This is the tricky part. The main focus of reading a pedigree will be to look at the parents and the grandparents of any prospective litter. Any generations beyond that are a bonus, but the biggest genetic contributors tend to be the latest two generations. Every reputable breeder will have a website, as well as the pedigrees of all sires and dams, so finding the base information should be easy. [caption id="attachment_2521" align="aligncenter" width="650"] We often focus on aesthetics in puppies, but not on intelligence. The best bloodlines out there will promise athletic, healthy dogs that also possess plenty of mental bandwidth. [/caption]When reading it, look for designations like MH (Master Hunter) or FC (Field Champion) after a dog’s name. Both are good.You may also see NFC (National Field Champion, AFC (Amateur Field Champion) or SH (Senior Hunter), which are all indicative of dogs that have titled and are likely to be passing on the right genes.If you see CH anywhere, pass. That is a show dog designation, and not what you’re looking for in a hunting dog. Show breeding is all about looks and has been disastrous to many of our once-popular sporting breeds.Keep in mind that it will be easier to find a good pedigree in a popular breed than it will be for a more obscure breed. The same goes for color. A lot of people want a chocolate, a red, or a silver Lab these days. The problem with many of these dogs is that they have been bred for color and nothing else, which is very similar to show breeding.Dig into the pedigree and look for the right field trial or hunt test designations before worrying about color — you won’t regret it. What the parents or grandparents were used for if it’s not clear from the pedigree. How many litters did the parents produce a year? [caption id="attachment_2522" align="aligncenter" width="650"] No matter what bird-dog breed you fancy, you should consider doing some pedigree research to find a litter that should contain the kind of puppy you really need. [/caption]The best dogs often come from small operations that are meticulous about their breeding, which means they might only produce a couple of litters per year. If there is a waiting list and an interview before you can put down a deposit, this usually means there has been some investment into the lineage. That matters. Well-bred dogs are worth a lot but convincing the average sporting-dog owner of that is not so easy. This is because they are usually more difficult to find than any run-of-the-mill dog, and they are more expensive. [caption id="attachment_2523" align="aligncenter" width="650"] A well-bred puppy is going to cost at least twice as much as an average dog, which is tough to swallow. The bright side is that it’s a one-time investment into many years of companionship at home and in the field. [/caption]These days, if you want a golden retriever that is field-bred (no show breeding) and boasts a pure pedigree and all of the health checks, you’ll spend at least $1000 and most likely, quite a bit more. You can find goldens all day long for half that price, but they’ll be a total gamble.Quick tip: If you’re unsure how to research quality bloodlines for your next bird dog, enlist the help of a professional trainer.Well-bred dogs are more expensive, and they are harder to find. However, look at it this way: you’re making a commitment that should hopefully last about a dozen years. Spending twice what you would for a questionable dog amortized over the lifespan of a dog you’re going to be very happy with is not much more of an additional investment. Factor in the likelihood that you’ll have a much better hunting dog and the idea of “buying up” is even easier to accept.A lot of people will still scoff at paying that much, and the typical justification is that they only hunt a couple of times each year, so who really needs an in-field rock star? The answer is, they do. And you do, too, probably; even if your days in the field are very limited. The thing about bird dogs these days is that even when a diehard upland hunter or waterfowler owns them, they only spend a small amount of time actually hunting. Most of their lives consist of being house pets. This means that while hunting skills, instinct and drive are all important, overall trainability and temperament are even more critical.A well-bred dog that comes from a line of thinkers will be much easier to train. My current Lab, Luna, comes from a solid pedigree. She’s a machine in the field, but at home she is incredible as well. It took me two days to house train her, which was a relief because I’ve never had a dog take to that task so quickly. I also had her sitting the first day we got her as a puppy, which I wouldn’t have believed possible until I experienced it myself.None of this came from exceptional training ability on my part, but instead was the result of paying up for a dog that carried the right stuff in her genes. Well-bred puppies are expensive, but they’re worth it. If you’re paying for genetic potential you’re hedging your bets against a litany of issues that might crop up, not the least of which is health and overall abilities in the field and at home.Forget what you think you know about picking a puppy and start researching litters. If that task is too much, enlist the help of a professional trainer. If you do, you’ll most likely end up with a dog that exceeds your expectations at home, and in the field.And who can put a price on that?About the Author Tony J. Peterson has written hundreds of articles for over two dozen national and local publications. Although he covers topics related to all forms of hunting and fishing, his passion lies in do-it-yourself bowhunting for whitetail deer and western big game. Peterson is an accomplished outdoor photographer and currently serves as the Equipment Editor for Bowhunter magazine and Bowhunter TV.Special thanks to StepOutside.org for providing this insightful content. In this video, Professional dog trainer Bev Millheim offers some sage advice for dog owners that are getting their young dog ready for its first hunting season. Tough the tips are focused on retrievers the substance can be applied to any breed. If Fido will see it on opening day he should see it first in training. Good luck on your first hunt!